The interviews just keep rolling with Sam Heughan (Jamie Fraser) from Outlander. Monday July 30th he sat down with Ryan Seacrest, and guest host Jenna Dewan on the set of Live with Kelly and Ryan. Jenna has been very vocal on her passion for the series, and even moderated the Outlander panel at San Diego Comic Con in 2017. During the interview Sam was asked about the recent tweets between him and co-star Caitriona Balfe (Claire Fraser) each joking about the others driving skills. Sam also speaks about upcoming Season 4, which is set to premiere in November on Starz. Ryan Seacrest and Jenna Dewan talk with Sam Heughan during the production of “Live with Kelly and Ryan” in New York on Monday, July 30, 2018. ©2018 Disney ABC. All Rights Reserved. 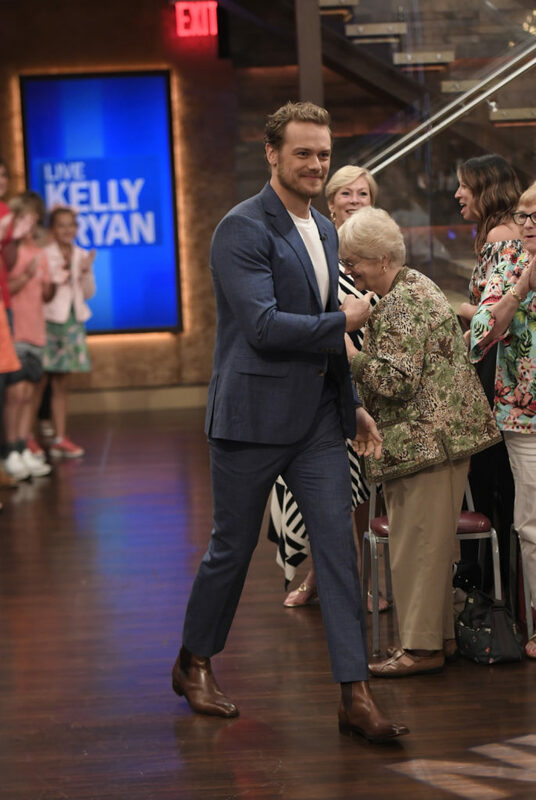 This entry was posted in Interviews, Sam Heughan, Uncategorized and tagged Interview, Jamie Fraser, Jenna Dewan, Live with Kelly and Ryan, Outlander, Ryan Seacrest, Sam Heughan by Ashley Fendt. Bookmark the permalink.